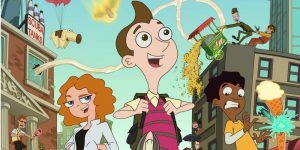 What makes Milo Murphy’s Law such a worthwhile addition to the Disney XD lineup is how well Povenmire and Marsh’s signature brand of “oddball, surreal” humor has transferred over from their previous efforts of Phineas and Ferb. That doesn’t mean Milo Murphy’s Law is Phineas and Ferb 2.0, far from it. This isn’t about kids trying to have their best summer ever, or an evil scientist trying to invent his latest “inator,” and you’re not going to get a song an episode. Although with Weird Al Yankovic and Dan Povenmire responsible for the show’s theme, perhaps a musical episode down the line wouldn’t be that far-fetched? This new show stands as a testament of what creators can learn from their first outing, as the pilot of Milo Murphy’s Law rolls out laugh a minute gag after gag that’re further commanded by its three likable leads. With Milo, there’s his charismatic optimism, despite everything around him always going wrong. The new kid on the block, Zack, has his newfound appreciation for the more interesting lifestyle by Milo’s side, even if it means risking potential death on a regular basis. Lastly, there’s Melissa (Sabrina Carpenter) being a confident, yet occasionally forgetful, ally to back up Milo’s tough and prepared nature, while also being a charming personality to take over the scene when she comes around. 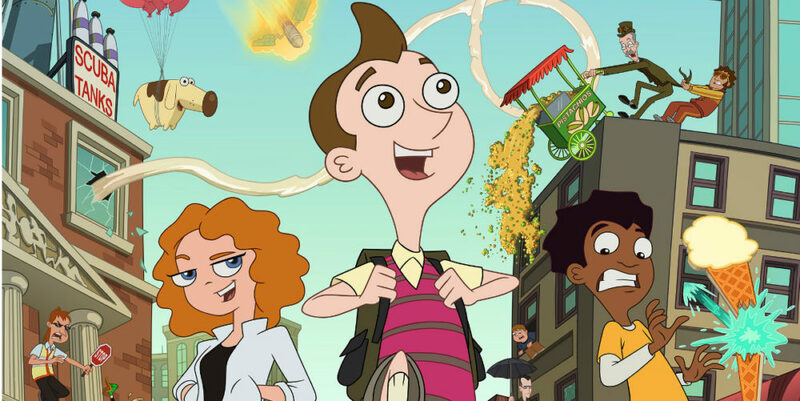 Bolster all this with just as engaging stories to guide them forward, these three well-rounded characters are what helps raise Milo Murphy’s Law into its humorous heights. The only small nitpick to be had in the pilot is we don’t get enough time to understand the background characters a little better, especially Milo’s dog Diogee (Dee Bradley Baker.) I’m sure this will be addressed as the episodes go on, and I am quite curious to see what role he’ll play as the show moves forward, but as of now his purpose feels just a tad bit too “deus ex machina,” since he really only came in to help save the day. But that’s very little to actually squabble over. Otherwise, Milo Murphy’s Law is not only a great reintroduction for Povenmire and Marsh, but it stands completely on its own as an all around superb Disney XD original. With fellow programs like Gravity Falls and Wander Over Yonder having ceased new episodes recently, its nice to get a new and exciting binge worthy production in their place. In Milo Murphy’s world, lightning striking twice is just part of being a jinx, but it also perfectly describes how well this series stormed out. Previous ArticleTV Review: Once Upon a Time 6x02 "A Bitter Draught"